1946 saw the world recovering after WWII and the US began a readjustment, too. Thousands of Rosies went back to the work in the home after spending the war years working in factories, Benjamin Spock publishes his The Common Sense Book of Child Rearing and The Best Years of Our Lives wins Best Picture at the Academy Awards. Dresses return to below the knee and shoulder pads continue to be popular. 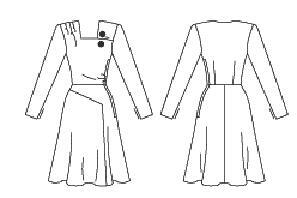 #N202 Semi fitted below kness has left shoulder yoke, right shoulder pleats and flared skirt. Long sleeves. (Belt, hat, broach and stole not included) This dress is made from a vintage pattern fitted to modern measurements.